The thing about tattoos used to be their permanence. Sure they could be erased with lasers, but that was expensive and painful and time-consuming, plus it didn’t always work so well. To commit to an image or message forever, on the skin of one’s own body—now that was impressive. 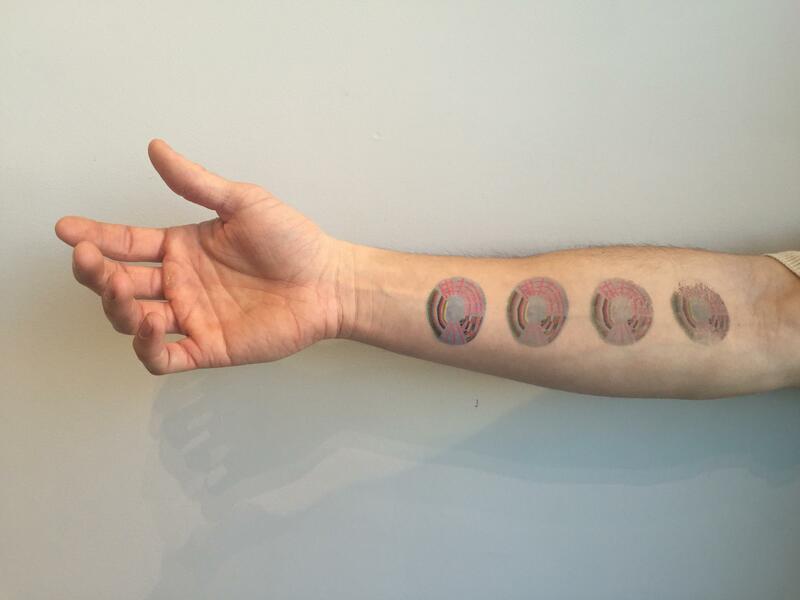 It all feels so out of date now, with the data glut of Google and smart phones, the ubiquity of tattoos, and the availability of temporary tattoos. But the appeal remains, even if the world has changed: the body begs to be marked and colored. Enter Benjamin Cook, painter of irrepressibly colorful grids, nets and stripes. Cook had the genius idea to shrink one of his paintings down to size, have it printed up as an edition of 500 by a temporary tattoo company, and give it away for free. Distribution problem solved! What’s forever, anyway?